Libby teaching me about placing gear. 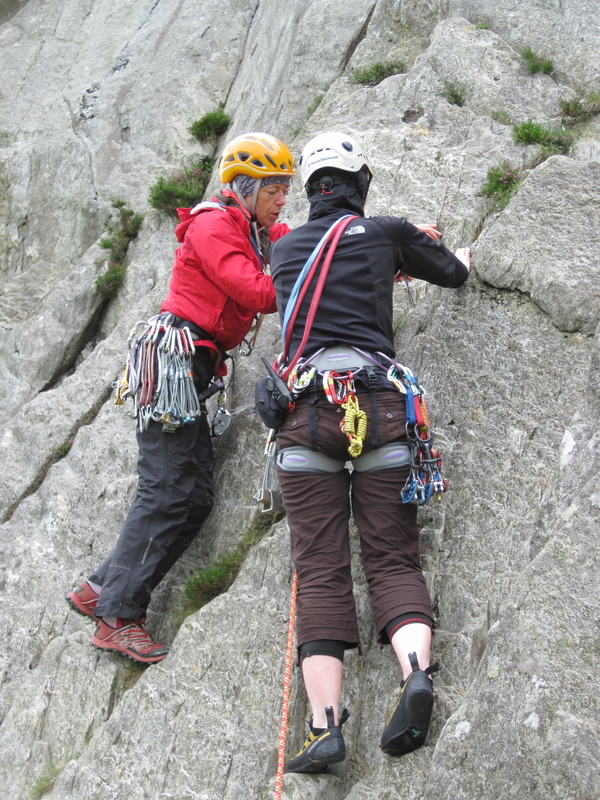 Women usually climb very differently to men, so I decided I wanted a female guide to help me through my first foray into leading. 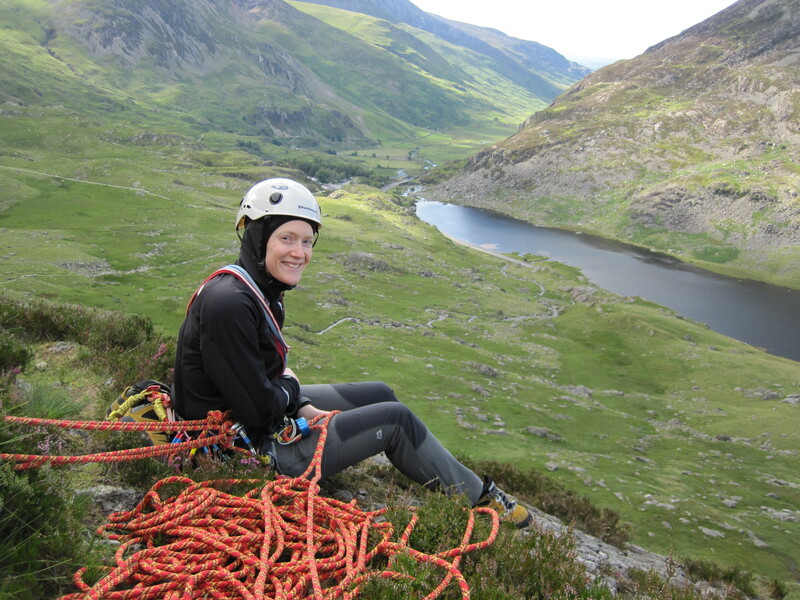 As we climb mostly in North Wales, Robin contacted Libby Peter, and we hired her for two days at the end of July 2012. 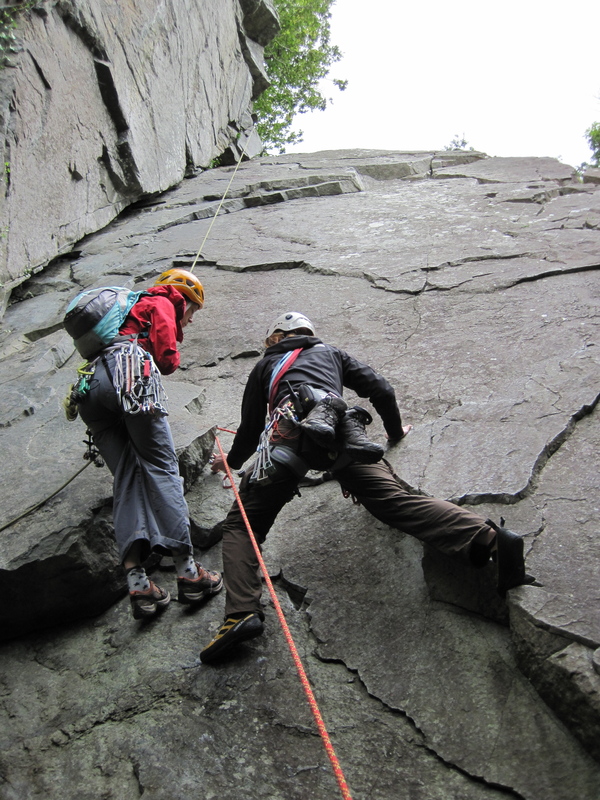 There are several ways you can do your first lead-climbs under qualified supervision, the cheapest commercially in the UK is probably being part of a group through an outfit like Plas-y-brenin or Glenmore Lodge, or as we did, by hiring an individual. We paid £200 per day for Libby, and had the advantage of one-on-one instruction as well as activities that matched exactly what both Robin and I wanted to learn and suited our abilities and fitness. Me and Libby after I had just done my first lead. So, what was it like? In a word: fabulous. 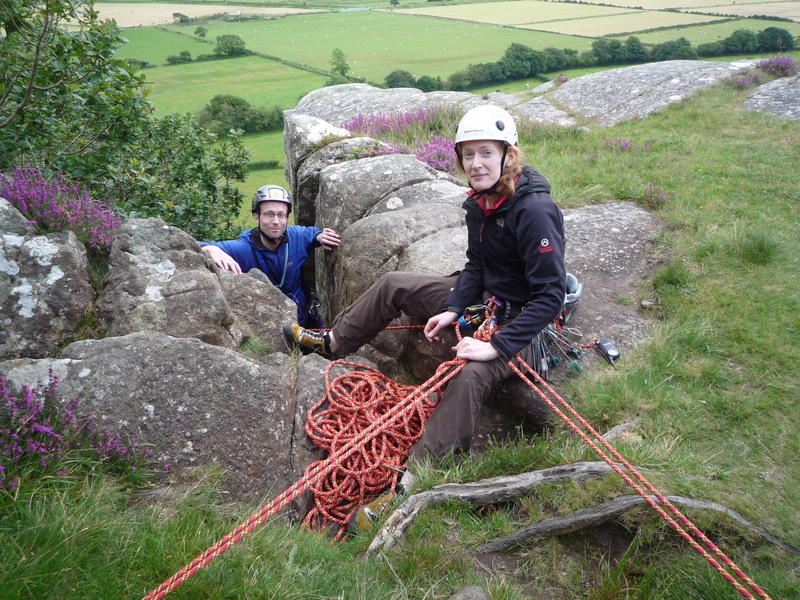 We jumped straight into my leading a Diff on Milestone Buttress, Rowan Route. I thought we’d have a gentle start, perhaps discuss gear placement, but no, it was “off you go, then”. At least I didn’t have time to get too nervous! I’d seconded Rowan Route about two years ago, so I had a reasonable idea of the route and knew it was well within my ability. Libby supervised me by setting up a top-rope and using an ascender to follow along side. She checked everything I did going along, offered advice and encouragement, and very usefully was someone to chat with and keep me from thinking to closely about what I was doing. Being a very popular route, finding gear placements was pretty easy, and aside from dropping most of Robin’s micro-nuts and struggling to find a second anchor point on the first pitch, I don’t think I did too badly. Robin led the second pitch so I had experience of leading through, but only climbed about half the proper distance making the third pitch very long. This had the consequence of making rope drag very difficult over the last few moves, and I also ran out of quick-draws. Luckily, Libby didn’t think it was cheating to steal a few off her harness (thank you!). Me leading Happy Return at Castle Inn. 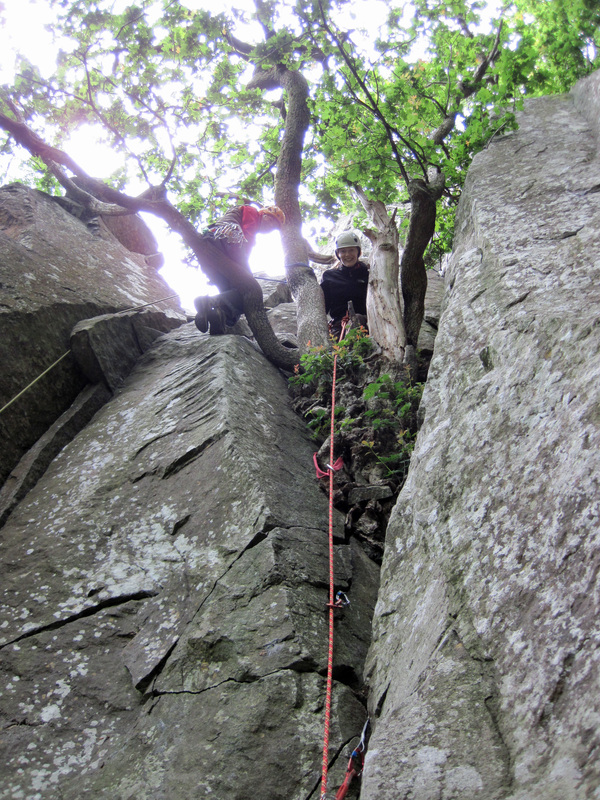 The rain moved in rather heavily towards the end of our first climb, so for the afternoon we headed north up to the A55 to one of a surprising number of quarry based sport-climbing venues, the Castle Inn. 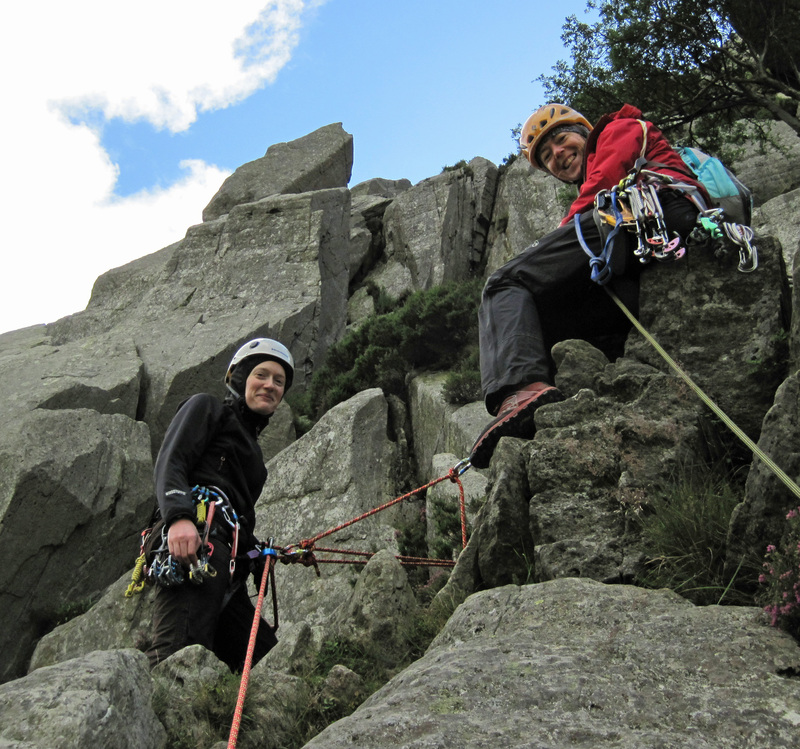 Here, Libby introduced us to the technical aspects of sport climbing – very useful for our honeymoon plans. I started off with a bottom-roped climb on Finale (F5+), then moved onto leading on Mogadishu (F4+). As I’m used to climbing 5+ or 6a indoors, it was surprising how daunting this felt – I got quite scared getting to the penultimate clip. After this, Libby left us to it to enjoy the end of a rather lovely sunny summer evening, and I did my first solo sport lead-climb up Happy Return (F4). The first day was nicely paced, I never felt out of my depth, and it was a great opportunity to demonstrate to myself (and Robin, who will be putting his life in my hands) that I can trust my rock skills. Libby and Me on the first pitch of Oberon. LIBBY: Ok, we’re going to climb here. It’s called Oberon. ME: This is a Severe?! ME: But, it’s a Severe! If there’s one thing I feel good at however, it’s slab climbing. I love the delicacy of this climbing style and feel much more at home, so given that Oberon’s first pitch is up a beautiful slab Robin and Libby didn’t have to try too hard to persuade me to take a stab at my first Severe. The start for this route is quite polished, but there’s a lovely lump of rock with a nice crack running behind just to the left about two moves up, so after a rather nervy start I got a couple of camming devices placed and began almost enjoying myself! This was actually a great first pitch, with some fun smearing moves onto the first narrow strip of ledge, after which you’re tiptoeing yourself up a right hand crack before traversing back left to top out onto a large shelf, which included a rather convenient tree for belaying from. Robin lead the second pitch fortunately as this was a chimney (I hate these almost as much as I love slabs), then it was time to complete the climb, working my way up a short gully followed by a short traverse then up a left hand corner crack. I found this last pitch quite tricky as I had a fear in the back of my mind of decking out onto the traverse part of the climb, and froze up about halfway up the final section. A quick whiz down the second rope from Libby, who’d been watching from above, to point out a hold my brain was failing to recognise, got me back on track, and my feet started moving up again. It was quite a relief to finish, although I felt very proud! And now, of course, I’m officially qualified to do a guest post on this blog. After a quick visit to Eric’s Café to get my caffeine addicted fellow climbers their hit, we went to climb Boo-Boo (V Diff). This starts at a large flared chimney, topped by the most amazing bundle of roots and a surprisingly large tree. It was clearly not as well used as the slab around the corner. It was dirty and buggy, and really not appropriate for someone with a slight spider phobia. While this route looked okay from the ground, it had a deceptive non-positive gradient, and I found this even harder than the morning’s Severe. Hanging one-handed off part of a broken branch and trying to flip a sling around the base of a tree without dropping it has certainly made me face some of my demons, and squeezing between the trunks has renewed my commitment to losing a few inches off my hips! I still shudder to think that when Robin came up behind me, one of the footholds I’d used on the most precarious of moves came loose and pinged off down the cliff… The proper line of the second pitch was too much for my knackered arms, so after Robin led this I naughtily sneaked round the side, then led the third pitch up a very easy (Diff) slab to finish. 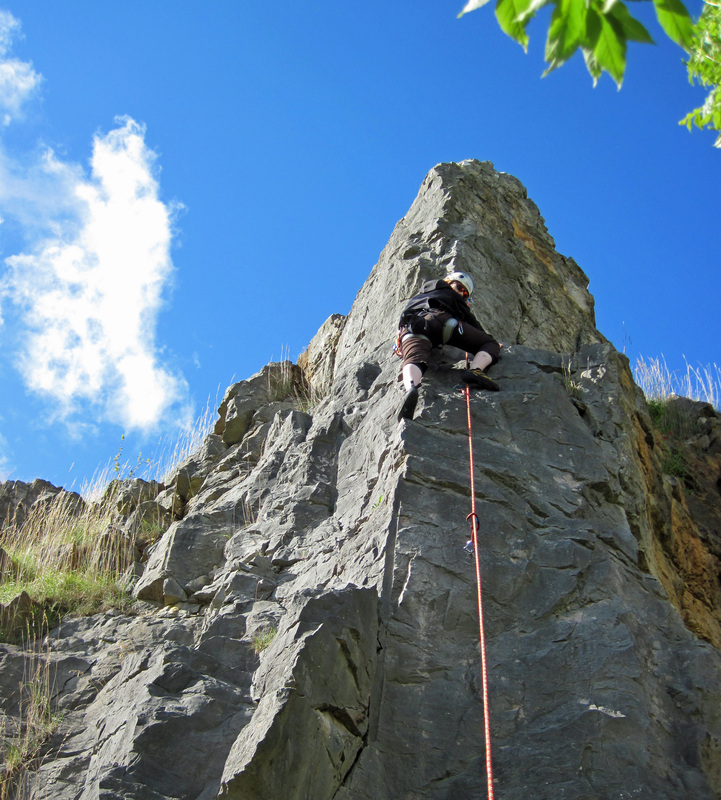 All in all, I have come away from these two days feeling very positive about lead climbing, and confident that I know how to lead safely and bring up a seconder. We also learnt how to tie off the belay plate when loaded and bring up a climber in difficulty using a neat pulley system using a screw-gate carabiner and a loop of the dead rope which I’m sure will come in useful at some point. Libby was the perfect choice of guide, positive and encouraging without being pushy and genuinely lovely company. Her support gave me a lot of confidence in my climbing and I feel privileged to have hung around on a rock face with such a hugely respected British climber. Advice for others making the same transition from seconding to leading is to prepare academically to make sure you understand about things like fall factors, back clipping, rope drag etc, learn to tie climbing knots in your sleep, always get several bits of gear in early and make sure you take more time planning your climbing moves before going for the execution as you really can’t get away falling off as much.